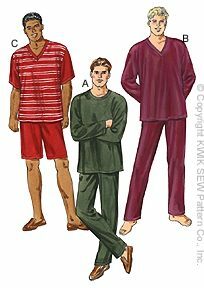 The Men's Pajamas are designed for stretch knits only with 20% stretch across the grain. We suggest single knit, interlock, thermal knit or textured knits. Men's pajamas. The pants, designed without side seams, have a stitched elastic waist. The View A shirt has full length sleeves and a ribbing neckband. The View B shirt has a V-neckline with a self fabric neckband and full length sleeves. The View C shirt has a V-neckline with a self fabric neckband, a contrast front and back, and short sleeves.